Intel has doubled down on servers as it looks to shed its reliance on PCs, but the chip maker's ARM competitors are ready to challenge it. New server and appliance chips based on the ARM architecture were announced at Computex in Taipei this week. ARM-based chips dominate smartphone and tablets, but the new chips from Cavium and Marvell show the processors are maturing quickly for use in servers. ARM servers are seen as a power-efficient alternative to Intel's x86-based systems, with companies looking to cut electric bills in data centers. ARM server chips have been around for years but have failed to register an impact because of hardware and software problems. But ARM server chips are becoming more competitive with support for DDR4 memory and the latest I/O and networking technologies. Intel had a 99.2 percent market share in server chips in 2015, according to IDC. Despite struggling for years, ARM server chip makers are holding on to create alternatives for Intel's Xeon chips, while hoping the market for their products becomes viable. In a research note issued Tuesday, IDC said ARM server chip makers will start gaining traction next year. AMD, which sells x86 and ARM server chips, is predicting ARM to have a 20 percent market share by 2020. At Computex, Cavium announced the ThunderX2, which is a second-generation server chip based on its homegrown design. It delivers roughly double the performance of its predecessor, ThunderX, which was introduced more than two years ago. A two-socket server with ThunderX2 could have up to 108 CPU cores and 3TB of memory. A ThunderX2 CPU has a maximum clock speed of 3.0GHz and new I/O technology, and it supports the latest DDR4 memory, all of which combine to boost server speed. 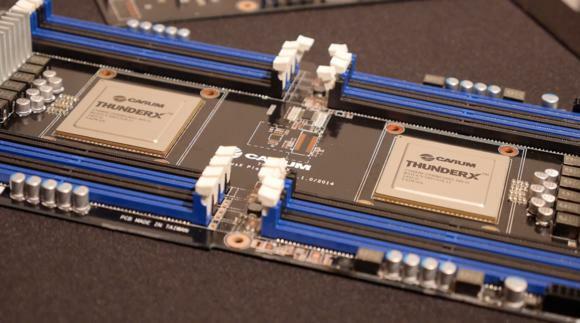 Cavium estimates the ThunderX2 internal interconnect is 2.5 times faster than ThunderX. The ThunderX2 is targeted at networking, Cavium's bread-and-butter business, and rack servers. ARM servers are being widely considered for use in cloud deployments, and this chip could be used in hyperscale environments, where servers are continuously added to meet growing data center needs. Cavium didn't respond to a request about when the chip will be available for servers, but vendor Gigabyte said it will ship ThunderX2 server products. Marvell's new Armada 7000 and 8000 family of ARM-based chips don't provide the high levels of performance delivered by Cavium's ThunderX2, but they are aimed at smaller home office deployments. The chips are mainly targeted toward storage and networking appliances but could also be used in entry-level servers. The Armada chips are based on the ARM Cortex-A72 chip design, which is also used in smartphones. The new design has more oomph than typical Cortex-A72 smartphone chips, with support for virtualization, DDR4 memory, error correction, Gigabit ethernet and many storage and I/O protocols. The chips are available in dual- and quad-core configurations, with clock speeds up to 2.0GHz. Marvell did not respond to a request for shipment dates. Other ARM-based server chip makers include Qualcomm, AppliedMicro and Broadcom.